"...Eerie Friend Of The Needy..." COMICS! Sometimes Gil Did 'em With Roy! In order to impose some sense of order and consistency on the post CRISIS DC Universe SECRET ORIGINS delivered 50 issues during the years 1986-1990, with each issue being dedicated to presenting the newly established origin of one or more DC characters. That's right, in 1986 -1990 DC Comics actually gave enough of a chuff about continuity to have given it a bit of thought so it all worked out nicely. I think we can all agree that the Nu52 has had none of that. Although DC's total banjaxing of their own continuity does still give us the joy of seeing Baleful Brian Hibbs going all puce every single time he realises that Batman now hasn't been Batman long enough to have had all those Robins. 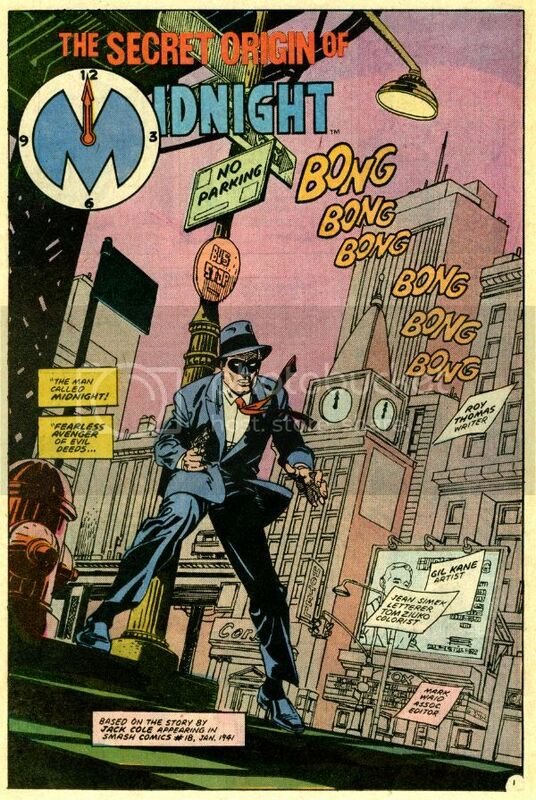 Yes, there was a time when DC Comics didn't just pretend everything made sense they actually made it make sense. Obviously Rascally Roy Thomas was all over this series like a rash. So much so that he wrote this comic. And Gil Kane's only gone and drawn it! GilRoy worked together on many magnificent series/characters all of which are better remembered today than this. Which is a shame. Mind you, I'm not even sure this character has ever appeared again. Feel free to correct me, as ever. 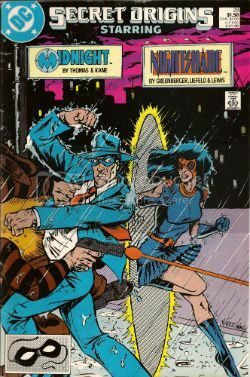 Midnight first appeared in the Quality published Smash Comics #18 (Jan 1941). The strip was certainly drawn, and probably written by, Jack "Plastic Man" Cole hence the little credit box in the splash above. Just as The Death Patrol were a copy of The Blackhawks so was Midnight essentially The Spirit. Yes, there is a text feature by the Rascally one I have cribbed from. Midnight then is a man in suit and a domino mask who decides, inspired by the character whose adventures he narrates on old timey radio, to right wrongs and smack bad guys about. His name comes from the fact that he confronts his enemies at...midnight! This is clearly a very poor gimmick that the bad guys would soon twig to ending in a dead man in a suit with a domino mask. Inspired, I have submitted to Dan Didio a treatment for a Nu52 treatment of the character which is basically the same except he attacks his foes when they are mid shite. Take my word, people have a really hard time defending themselves when they are on the pot. Anyway, I think it has the requisite level of class modern DC Comics requires and I breathlessly await their response. As much as I treasure Roy Thomas, and his work here is entertaining and sprightly as befits the pulpy period set material, I am actually here to talk about Gil Kane. Because 1980s Gil Kane is what I'm all about. Sadly I wasn't invited to personally watch Kane create the art on these pages but to me it looks like he's using markers. That's the sign of a confident man right there. Of course, so I hear, he would have broken down each page into rough layouts down to the panel level. Usually then some tightening up would transform the layouts to pencils and then, naturally, the final inking. But Kane, so I've read, would skip the pencils and just bang! ink over his layouts. With markers. That's...confidence. That's Gil Kane. Worship at your convenience. Of course the markers may be a mundane reason for the obvious lightness of detail in Kane's work. Certainly in "The Secret Origin Of Midnight" Kane continually veers away from heavy detail. So much so that his hatching is very rarely even crossed. Cross hatching and heavy detail were the mark of illustrators and, for Kane, there was a clear delineation between artists who favoured continuity and those who had an illustrative bias. Kane was a continuity first guy. To clarify this Kane would often cast it in terms of his work versus that of the Filipino school. 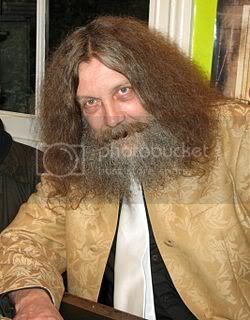 Hence his documented dissatisfaction with Rudy Nebres inking of his pencils on the Marvel John Carter series. The reader's eye was meant to flow through Kane's pages obeying the visual rhythm set by the artist himself. When detail occurs it occurs in controlled quantities and its purpose is specific. Here city scenes seem detail rich but on closer inspection the illusion of detail is the result of an accumulation of what turn out to be visual generalisations. Kane saves the more honest detail for when he shows a face in close up. On these occasions he uses his hatching to cue in the mood of the subject regardless of light sources as with the noir movies of his youth. Basically for Kane illustration is used to convey intensity. Here it's usually the intensity of the villainy of a bald fat man but my point remains. Also present on these pages is Kane's constant attempts to differentiate between the flesh and the forms of the world it inhabits. It might be argued that there is a concerted and clear divide between the living and the inert in Kane's art. This is a city based tale packed with artfully implied period detail, including suits that make natty look tatty. At no point is there any confusion on the part of the reader between the person and their clothing. This is due to Kane's skill at drapery but also to the fact that he varies the level of detail and line-weight between the clothes and the flesh that they drape. Noticeably so. A striving for seperation, and yet also some balance, between the natural and the manufactured line was an important part of Kane's artistic ambition. He would always be quick to praise Lou Fine, an artist who Kane felt had achieved excellence in both the geometric and organic line. 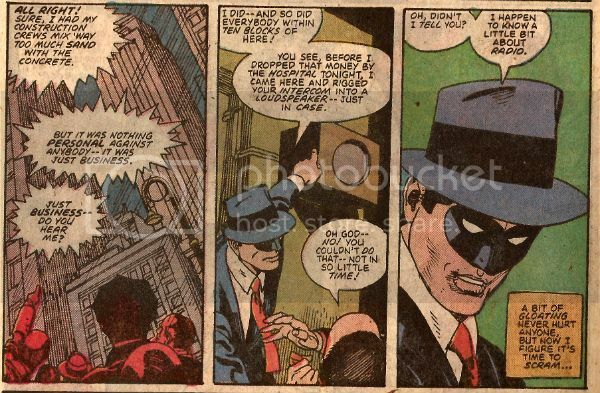 However, in all fairness I should note that Gil Kane could draw men in hats better than Lou Fine. 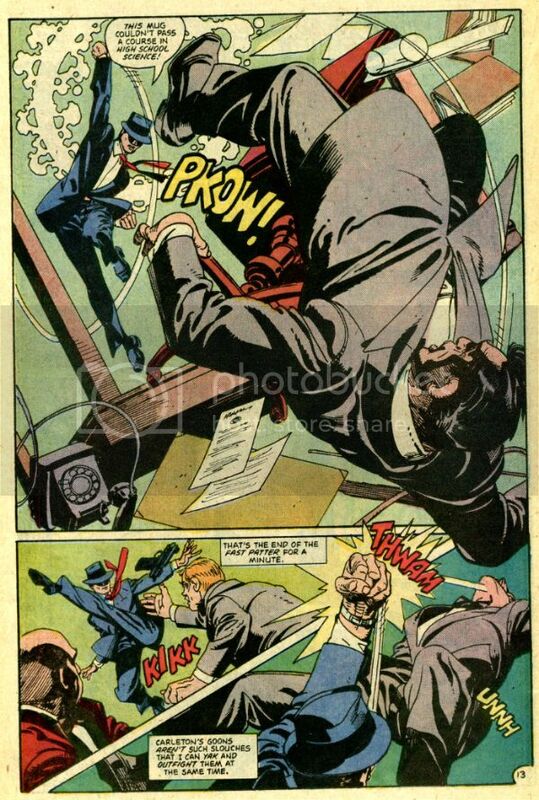 Oh, don't worry this comic contains all the explosive movement, bombastic gymnastics, panel breaking, in-panel montages, punched people back flipping and chisel chinned cavorting that the most frenetically entertaining and irresistibly enjoyable work of Gil Kane always contains. I just thought I'd highlight a couple of things I wouldn't usually mention. If I came off sounding like someone having a dry drunk please don't let it put you off this comic should you see it. After all, it's 1980s Gil Kane and that's VERY GOOD! After all, if 1980s Gil Kane is anything he's certainly - COMICS!! !